Indian cricket officials have demanded the suspended chairman of the highly lucrative Indian Premier League answer a raft of accusations of corruption. 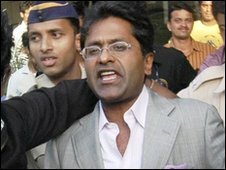 The investigation of Lalit Modi includes alleged franchise bid rigging and broadcasting rights irregularities. The Indian cricket board, the BCCI, named an interim IPL chairman after crisis talks on Monday. It said that "ethics and transparency" were vital. Mr Modi has denied all allegations of wrongdoing. The IPL started in 2008 and has become a multi-billion dollar industry, attracting some of India's wealthiest businessmen and women to its franchises. The Twenty20 format competition features many of the world's top cricketers. Ever since he launched the IPL, Lalit Modi has polarised opinion. The flamboyant chairman came up with an audacious idea to mix the two national Indian obsessions of cricket and showbusiness. Three of the teams are owned by Bollywood stars. It was glamorous, fast and exciting. The shortened format of the game was perfect for prime-time television. It was an instant hit. In three years the league has tripled in value. The IPL has been estimated to be worth in excess of $4bn. But there have been, until recently, muted concerns over financial transparency. At the same time Mr Modi's extravagant, unconventional and autocratic style of leadership has ruffled feathers, especially within the BCCI. There has been no suggestion the IPL's future could be under threat; it's simply too popular. But it may have to continue without the man who made it all happen. The BCCI named Chirayu Amin, an industrialist and head of the Baroda Cricket Association, as interim chairman. It said a number of documents were missing from the IPL office which tax officials had been asking for. The BCCI appointed a board member to oversee their collection. BCCI president Shashank Manohar said: "The IPL is a great property and commercial aspects in certain events is an important thing. However, ethics and transparency is more important." He added: "Everyday the income tax department is asking for documents but we don't have them in our custody." Former India national captains Mansur Ali Khan Pataudi, Sunil Gavaskar and Ravi Shastri have been appointed to organise the next season of the IPL. Mr Manohar said the suspension had not been imposed until after Sunday's final of this year's IPL, because the BCCI had not wanted to disrupt the tournament. After the final in Mumbai, in which the Chennai Super Kings beat the Mumbai Indians by 22 runs, Mr Manohar issued a statement saying: "The alleged acts of individual misdemeanours of Mr Lalit K Modi... have brought a bad name to the administration of cricket and the game itself." Mr Modi was suspended from "participating in the affairs of the board, the IPL, the working committee and any other committee of the Board of Control for Cricket in India". Mr Modi was originally scheduled to attend Monday's meeting in Mumbai but declined to do so. On Sunday he changed course and said he would attend but that the charges against him would have to be made in writing. The meeting took place without him. This is the worst crisis to hit Indian cricket since a match-fixing scandal involving senior national players in 2000. The BBC's Chris Morris in Delhi says the IPL is Mr Modi's brainchild and has been a huge success. But he says there is now mounting evidence that there has been almost no financial oversight and this could do serious damage to its global sporting brand and to the image of India itself. When he heard of the suspension, Mr Modi reacted defiantly. "Good for them," he told Indian TV channel NDTV. "Are they so scared of me attending? Are they so scared of the truth? "I will not be able to attend the meeting, but I will wait for my turn," he said. Earlier, in an address to the crowd after the IPL final, he insisted the league was "clean and transparent". "There have been some off-field unpleasant dramas based on the unknown, half-truths and motivated leaks from all sorts of sources," he said. "I reassure you that if there has been any flouting of the rules and regulations or if there have been any irregularities, I shall take full responsibility." The crisis erupted after Mr Modi revealed on his Twitter account that a female friend of Shashi Tharoor, a junior government minister, had invested in a consortium awarded a new IPL franchise in Kochi. That revelation caused a storm which sparked Mr Tharoor's resignation and also led to government investigations into the teams, sponsors, broadcasters and event managers associated with the IPL.